Oakfield Corners takes Premier Breeder honors. As judge Blair Weeks made his much anticipated final Red and White Champion selection of the day, the crowd rhythmically clapped along to “Here we go” as he circled the six contenders. After evaluating 268 head, he high fived Oakfield A Shampagne-Red-ET’s leadsperson as his Grand Champion selection. Earlier in the day, this Mr Apples Armani-ET daughter was also awarded Intermediate Champion, as well as Best Udder of Show after topping the Junior Three-Year-Old class for Westcoast Holsteins of Chilliwack, British Columbia, Canada. Reserve Grand Champion honors went to Highcroft Absolute Lily-Red. 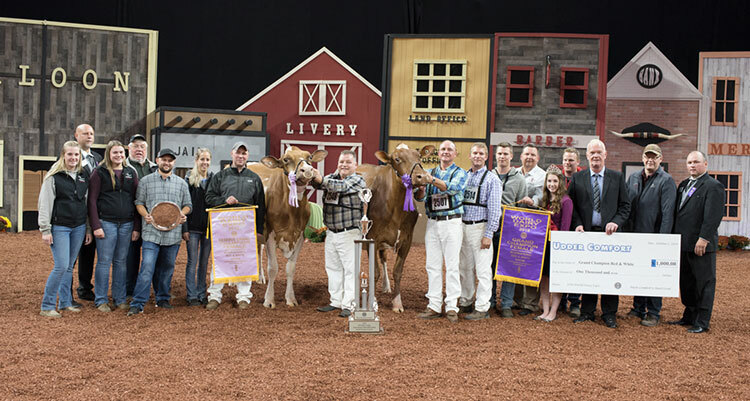 She was the winning 4-year-old cow and was exhibited by Maple-Downs Farm II and Thomas Hoskings, Jr. of Middleburgh, N.Y. Lily had been tapped as Senior Champion just moments before. Best Bred and Owned of Show went to Westcoast Defiant Addison-Red. She was the winning Senior Three-Year-Old. In the Junior Show, Grand Champion honors went to Robin-Hood Pretty In-Red. This 4-year-old was exhibited by Regan Demmer of Peosta, Iowa. Ms AOL Diamondback Rasberry-Red-ET was Intermediate and Reserve Grand Champion for Jaydn, Kennedy, Caroline, and Andrew Kimball of Windham, Maine. The youth exhibitors took the lead in the heifer show, claiming champion honors in both the Junior and Open Shows. Junior Champion was the Fall Calf, Ms Kress-Hil Saphire-Red-ET. Saphire is owned by Owen and Kendyll Kress and Savanah Barts, Newton, Wis. Mason, Carter, and Evan Jauquet, along with Carmen and Spencer Haack of Pulaski, Wis., earned Reserve honors with Synergy Jordys Spike-Red-ET, who was also from the strong Fall Calf Class of 40 entries. The Nasco Type and Production Winner was Hilrose Advent Anna-Red-ET. She was also recently named Wisconsin’s Cow of the Year for Joseph Brantmeier of Sherwood, Wis.
Premier Breeder went to Oakfield Corners of Oakfield, N.Y., on the strength of the Grand Champion Cow. They also were Premier Breeder and Premier Exhibitor of the heifer classes. Westcoast Holsteins owned the Grand Champion, and they took the Premier Exhibitor banner. Apples Absolute-Red-ET was named Premier Sire. Nearly all of the champions in the show trace to KHW Regiment Apple-Red-ET either through her daughters, her clones, or her sons and grandsons. So, if there was a Premier honor on the maternal side, Apple would have taken that prize.